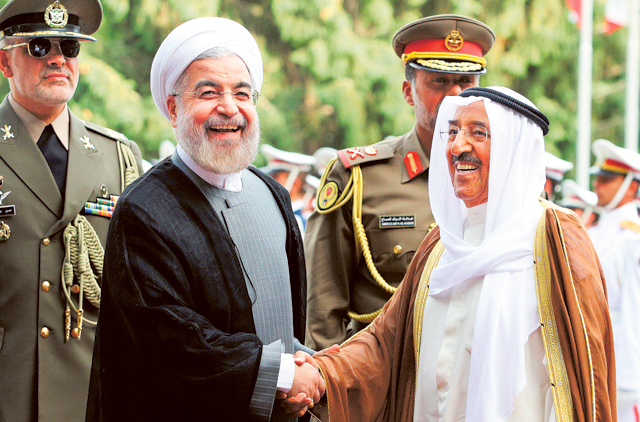 Manama: As Kuwait’s Emir Shaikh Sabah Al Ahmad Al Sabah makes his first visit to Iran since he became Emir in 2006 and holds his first meeting with Iranian President Hassan Rouhani, cautious optimism and persisting uncertainty are the themes of the day. Officials from the two countries have been expressing optimism about a new page between the two neighbouring countries that will in turn help ease strains across the two shores of the Arabian Gulf, especially with Bahrain, Saudi Arabia and the UAE. Relations between Kuwait and Iran have been through highs and lows for decades, driven mainly by national interests. Kuwait sees Iran as a political heavyweight with strategic importance while Tehran sees Kuwait as a reliable ally with a critical geo-strategic location between Saudi Arabia Iran and Iraq. Kuwait and Iran have had a long history of commercial exchanges between the ports dotting both countries. In 1961, when Kuwait became independent, Iran recognised the new state in the same year and opened an embassy in Kuwait City in January 1962. In 1973, Iran sided with Kuwait in its standoff with Iraq and expressed its readiness to send a military force to Kuwait. Iran’s prime minister stated that his country would not tolerate any attempt to alter the geo-political situation of the region. However, the situation changed in 1979 after the Iranian Revolution toppled the regime in Tehran. Kuwait was suspicious and was openly cautious about the developments even though it was one of the first countries to recognise the new regime. In fact, its foreign minister at the time was the first Gulf official to visit Tehran following the revolution, according to Ashraf Mohammad Kishk, a Bahrain-based analyst. Tension began to set in between Kuwait and Tehran when the Iran-Iraq war broke out in September 1980. Kuwait insisted on a neutral stance and asked both countries to end the war. The crown prince said that his country was ready to mediate and reach a settlement that would be satisfactory to both capitals. However, as the war dragged on and Kuwait was targeted by missiles and attacks that ominously threatened its security and stability, Kuwait City understood that Iran could win the war, which would be a clear threat. Kuwait announced its political, moral and material support to Iraq, resulting in renewed tension between Kuwait and Iran. That situation however changed in August 1990 when Iraqi troops invaded Kuwait. Iran rejected the invasion and stressed that it would never accept that Iraq take over Kuwait even if Arab countries failed to deal with the situation decisively. Iran called for a complete withdrawal of the Iraqi troops and emphasised its support to all economic sanctions against Iraq to force it out of Kuwait. Exchanges of official visits intensified after Mohammad Khatami, often considered as among the most moderate leaders, became president in 1997. In November 1997, Iran’s foreign minister made a visit to Kuwait to help reinforce Tehran’s relations with the Gulf countries. In 2002, Iran’s defence minister visited Kuwait and called for closer cooperation to confront any country that would attempt to repeat the attack on another country in the region, referring to Iraq’s behaviour with Iran in 1980 and Kuwait in 1990. In 2002, Kuwait’s Parliament Speaker visited Iran and called for a secure and stable regional order that would help ease concerns about the future. In 2003, Kuwait’s foreign minister visited Iran where he signed three economic agreements and laid the ground for closer cooperation. However, despite official statements about the “resounding success” of the visit, concrete results have not really followed. One decade later, with the growing tension in the region now plagued by increasing levels of sectarianism and religious militarism, there is hope in the region that the high-level contacts between Kuwait City and Tehran would usher in a new era of stability and security.